80's movies have never really been a hit with me. They're all the same, especially the ones based on a teenagers life. Like Dirty Dancing (not particularly a special movie). So is Fame (1980) the exception? Well, it certainly isn't the rule. 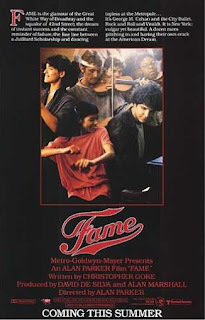 Fame is a story about a few teenagers who go to an elite Performing Arts school in New York to follow their dream, whether it be acting, dancing or singing. As always, there are ups and downs and it's not all easy, and while these students are focusing hard at school they are also focusing on building their lives so they can become adults. Each person is blessed with talent, and put their all into the sector they have decided to study. All this with 5 classes a day and a hot lunch. Unfortunately, Fame has suffered the remake treatment when that really isn't necessary. This version is fine, it completely makes the 80's look like not such a bad decade after all. The ensemble cast makes for easy viewing, with stand-out performances from Irene Cara, Maureen Teefy, Gene Anthony Ray and Paul McCrane. It's not clear whether these students reach Fame, but it's obvious that they're well on their way. Fame is a movie to treasure, just forget about the new version.